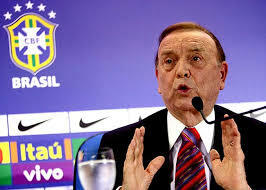 April 29 – The Brazilian parliamentary inquiry (CPI) into corruption in football – actually called CPI da Mafia de Futebol – has requested interviews with former president of the Brazilian FA Jose Maria Marin (pictured) and Traffic founder Jose Hawilla, both currently confined to the United States as part of their agreements with the US Department of Justice as it continues its football corruption prosecutions. The CPI has requested interviews with Brazilian coach Carlos Dunga, FIFA president Gianni Infantino and star Brazilian striker Neymar’s father. Paraguyan Alejandro Dominguez, newly elected president of CONMEBOL, is also on the list. The CPI has approved for a number of representatives to travel to the US to conduct the interviews of Marin and Hawilla, though it is not clear if the US Department of Justice has given its approval. No specific reason is given for the request to get Infantino to testify and it may not be linked with his new role as FIFA president but to former work at UEFA, potentially in regard to third party ownership which has been a controversial staple of the football economy in Brazilian football. The investigatory commission was set up earlier this month by the Brazilian Chamber of Deputies to examine the allegations raised against Brazilian football administrators at the CBF, and FIFA. Congressman Laudivio Carvalho is heading the commission. Marin was among the seven arrested during the May 2015 raids at the Baur au Lac Hotel in Zürich, initiated by the US authorities. He is currently on bail and under house arrest in the US, awaiting trial. The interrogation will center around the dual role Marin held as head of the Brazilian FA and the Local Organising Committee of the 2014 World Cup. The CPI is also targeting Hawilla, the founder of the sports marketing agency Traffic Group and the biggest . At the end of 2014 Hawilla pleaded guilty to charges of corruption, including racketeering, wire fraud and money laundering. He has forfeited $151 million. Hawilla, like Marin, is under house arrest in the USA. The CPI is seeking clarification around Traffic’s TV rights contracts with the CBF. Both Carlos Dunga and Neymar’s father have been invited to clarify marketing aspects in relation to the Brazilian national team – US appareil firm Nike held the international rights and are also indicted in the US investigation. Footballer turned senator Romario is leading a similar commission in the Brazilian Senate. This commission also has corruption in Brazilian football in sight as well as the organization of the 2014 World Cup. Romario and his colleagues have specifically decided to not invite Marin for questioning out of fear that it may offer Marin a way out of his trial in the USA.